Chios belongs to the Northeastern Aegean islands. 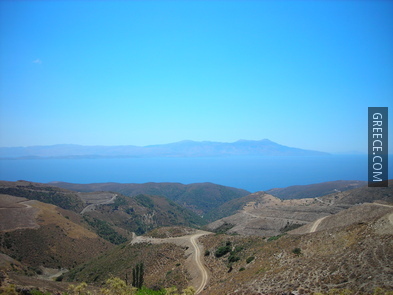 South of Lesvos, it is one of the most beautiful islands of Greece. 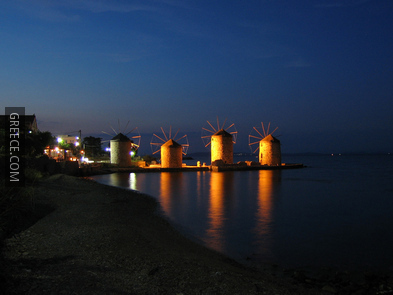 Chios is located very close to Asia Minor; the Canal of Chios runs between the two coasts. The island has a surface area of about 904km² and is inhabited by approximately 53,000 people. Chios is still quite untouched by tourism, despite its beauties, such as wonderful beaches, lush vegetation and superb medieval villages. Tourism is low because Chios has been economically self-sufficient for many years, thanks to its shipping industry and gum production from mastic trees and bushes, native to Chios. The island can cater for every tourist need, ranging from large resorts to deserted beaches and forests, traditional villages in the mountains and near the coast. 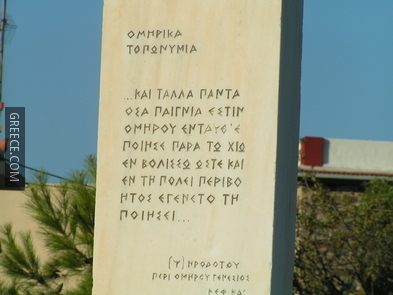 According to mythology, first king of Chios was Oinopeonas, grandson of Cretan king Minos, son of Dionysus and Ariadne. He taught the islanders how to cultivate vines; Chios is famous for its wines ever since. The legend says the island owes its name to the daughter of Oinopeonas, Chiona. Archaeological excavations at Chios revealed the island has been inhabited since the Neolithic era. However, the island joined fates with the rest of the Aegean, when the Ionians started settling here, starting circa in 1100 B.C. The Ionians colonized a series of islands along the shores of Asia Minor, and soon took the lead in advancing Greek culture. Although Chios formed a loose confederation with other Ionian city-states and islands, they were conquered by Persians in the second half of the 6th century B.C. After the Greek-Persian Wars, Chios joined the Athenian League, but soon got tired of Athenian ambitions. Athens punished the rebellious, forcing them to rejoin the alliance; they finally gained their independence in 354 B.C. Chios was annexed to the Roman Empire and the Byzantium; we are still in the dark for these eras. In the 13th century, in the aftermath of the 4th Crusade, the Venetians and the Genoese moved to the island. During the Ottoman rule, the island actually gained many privileges, but when the War of Independence started (1821), Chios helped considerably; as a result, the Turks retaliated by slaughtering nearly 25,000 inhabitants and enslaving 80,000. Greek admiral Kanaris entered the harbour of Chios at night and blew up the Turkish flagship. This massacre became the subject of a famous painting by Delacroix (The Massacre of Chios), which created positive opinions in the Western world, in favour of Greek independence. Chios Town: The capital and main port is located in the eastern part of the island, opposite the city of Izmir on the coast of Asia Minor. 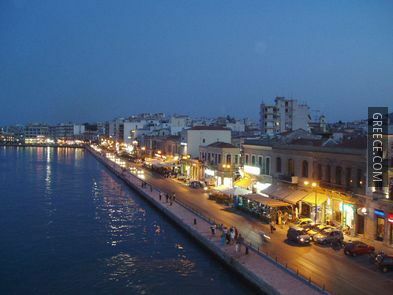 With many schools, a university, and cultural centers, Chios Town is the administrative, spiritual, cultural, business and educational centre of the island. Despite the town experiencing extensive damage during the disastrous earthquake of 1881, a part of the old city still remains in the heart of the modern town. Neoclassical buildings, mosques and buildings of strong Arabic influence adorn this part of the town. Shops, entertainment venues, accommodations and a good tourist infrastructure are available. 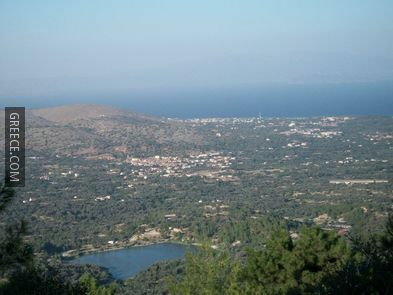 Pyrgi: This is one of the most beautiful villages of the island located 25km south of Chios Town, in the area of Mastichoria (Mastic Village). 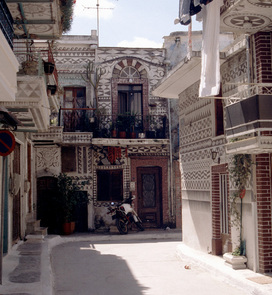 Narrow roads, innumerable churches, among them a 13th century Byzantine church of Agioi Apostoloi, in combination with the unique black and white geometrical decor of the houses (called Ksista), characterise Pyrgi. The houses along the border of the village are terraced, with no doors and windows on the outer side, thus forming a defensive wall. Accommodations, cafes and excellent taverns are available in the village. Mesta: This is a perfectly preserved byzantine citadel (14th and 15th centuries). 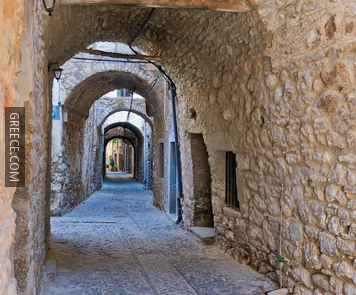 Situated 35km southwest of Chios Town, it is one of the finest examples of defensive architecture. The houses are terraced, forming a fortified wall. Narrow cobblestone alleys wind around the houses, leading to a lovely central square. 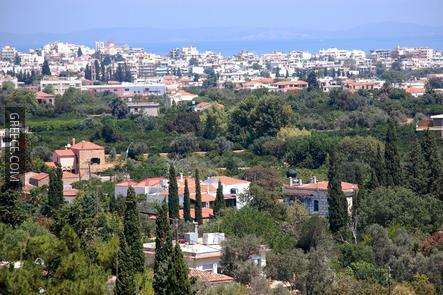 The ring road, the wall, the tower, the Church of Agia Paraskevi, the gate of the castle, the Tower of Militas, the village square and the New and Old churches of Taxiarchis are of great interest. A few accommodations as well as some picturesque cafes and taverns can be found at the village. 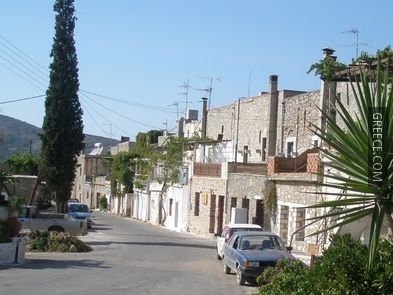 Volissos: This village is located northwest of Chios Town and is the capital of the Municipality of Amani. 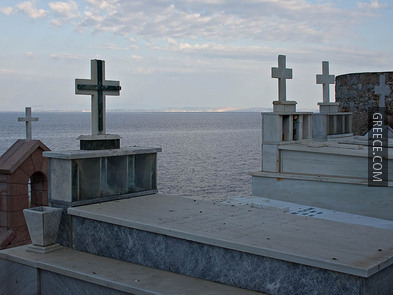 One of the oldest settlements on the island, Volissos has been built amphitheatrically on the slopes of a mountain. The walls, the towers and other ruins of a medieval Byzantine castle overlook the village. This castle has a trapezoid shape with six circular towers. Inside, there were several buildings, cisterns and churches. Also, there was a tunnel connecting the castle to the coast and the Pithonas district. Some public services, a community clinic, accommodations, cafes and taverns are available in this village. 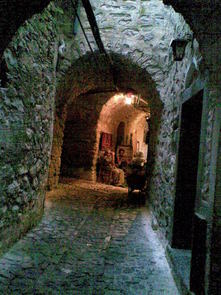 Olympi: This 14th century medieval village is situated 31km south of Chios Town. The settlement lies in a small, barren valley far from the sea. The houses are terraced, without windows and doors on the outer walls, and the streets are narrow, paved with stones, and connected to the central tower square. This type of fortress, a four cornered structure, was built for protection against pirates and Turks. The functional character of the houses was geared to defense, and thus the inhabitants were able to move about the roofs without being seen. 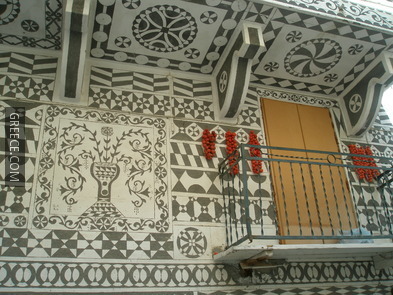 The four-sided shape of these houses, their thick structure, the defense system, the gray walls, the small areas for general use, and their relation to the treeless, natural surroundings, means that this village was definitely built here on purpose, which may have been imposed by the Genoese. Accommodation, cafes, taverns and shops are available here. Kambos: The area of Kambos is the most beautiful of the island. 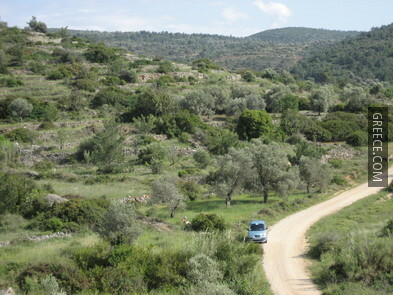 It is a green valley 3km south of Chios Town, covered with citrus orchards. The surrounding low mountains are the source of underground waters, which make Kambos a vast garden with flowers and citrus trees. 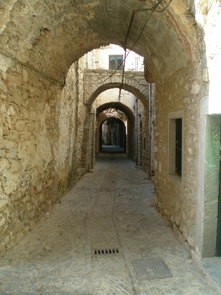 In the 14th century, the Genoese selected this area to build their mansions, as did the local aristocrats in later years. High walls of Thymiana stone protected the mansions from dust, winds and cold. Shady paths, gardens of flowers and creeping vines of jasmine create a unique atmosphere. Two or three-storey houses, arched doors and windows, arcades with small marble pillars, balconies held up by small arches, huge entrance gates with coats-of-arms, pebbled courtyards and frescoed ceilings offer a unique architectural style. Unfortunately, the massacre of 1822 and the earthquake of 1881 destroyed significant structures. Nevertheless, Kambos is worth more than just a quick trip. Avgonima: This village is situated on the main road of central-western Chios, 16km away from Chios Town, on a rocky hill. The settlement is referred to as “cave village” because of the unique style of houses which look like caves and the village is virtually invisible from a distance. Don’t miss the sunset from Avgonima and the amazing pine forest. Accommodations and excellent taverns are located here. 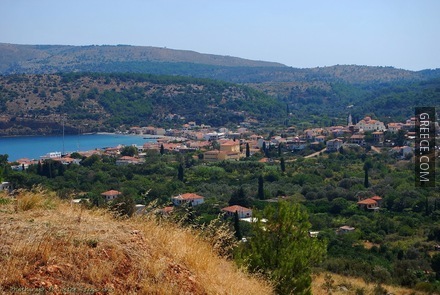 Kalamoti: The village was built in the 14th century during the Genoese rule and it is situated about 20.5km south of Chios Town. It is a traditional settlement with two-storey stone houses. 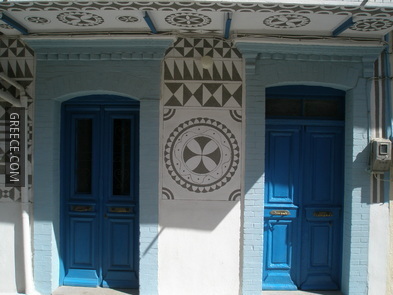 The doors of the houses are carved in a traditional fashion. Like many other villages of the island, Kalamoti was built with defense in mind, to protect its inhabitants from pirate attacks. 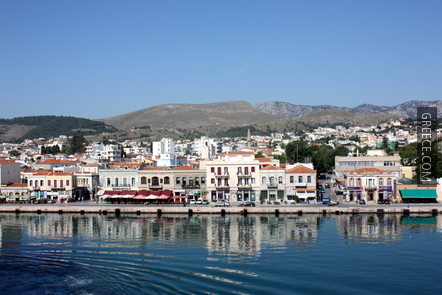 Vrondados: This is a seaside town situated 4km north of Chios Town, east of mountain Aipos. 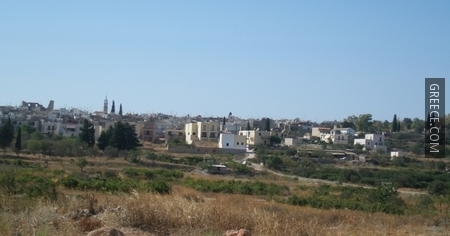 The settlement lies among olive trees, gardens, almond trees and many other fruit-bearing trees. 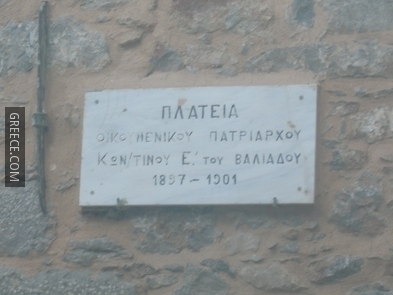 In the revolution of 1821, the inhabitants of Vrondados contributed considerably to the Greek Fleet. Even today, many well-known ship owners are from this town. According to tradition, Christopher Columbus visited Vrondados in order to study nautical charts and get information of experienced Vrondadian seamen, who helped him for his great voyage of discovery. Nowadays, accommodations, cafes, bars and taverns are available at the town, as well as some fine beaches. Mavra Volia: This beach is located 5km from the village Pyrgi. 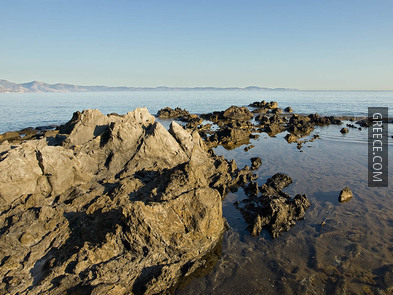 The beach has small black pebbles, which were created when the volcano overlooking the beach erupted, during the Prehistoric era. Actually, there are three connected beaches under the same name, with deep, dark blue waters. In the immediate vicinity of the beaches, are ancient areas of the 6th century B.C. There are apartments and studios, cafes and taverns at the seaside village Emporio, nearby. 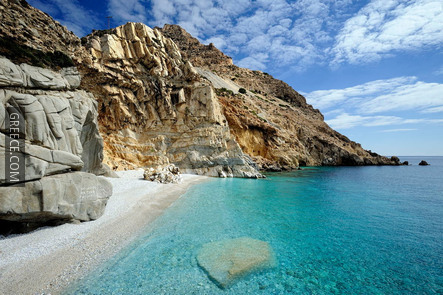 Karfas: This beach is located 7km south of Chios Town and is one of the most beautiful beaches of the island. Karfas has fine sand and clean waters and offers all necessary tourist facilities, such as accommodation, umbrellas and water sport equipment for rent. Large hotel units, inns and rooms to rent are near the beach, as well as cafes, bars and restaurants. Komi: This beach lies 4km outside the village of Kalamoti. The long shore of Komi beach is virtually endless. The beach is sandy and has all kind of tourist facilities. Agia Dynami: This beach is close to Salagonas bay and is completely untouched by human. It was named after the chapel of Holy Power near the bay. The beach is sandy, quiet and with no facilities. Nagos: The area of Nagos is 5km from the village Kardamyla. The bay is beautiful with a pebble beach, running water springs, platens and a unique landscape. 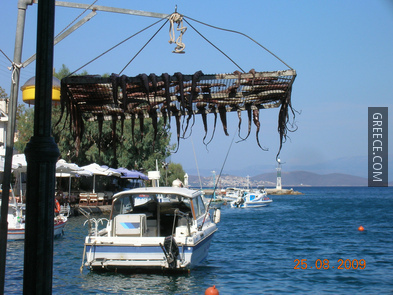 There are few restaurants and taverns offering fresh seafood. Lithi: This bay is located at the southwest part of the island and has a beautiful sandy beach. There is a tiny seaside settlement nearby, famous for its excellent fresh fish and seafood. The sunrise at Lithi is astonishing and truly memorable. Agia Irini: This beach is located 35km southwest of Chios Town on the road from Limenas Meston to Elata. It is a well sheltered bay with small white pebbles, green-blue waters and few tourist facilities. Trahili: The beach is located 5km from the village of Mesta and consists of two small bays. It is a sandy beach with crystal waters and no tourist facilities. 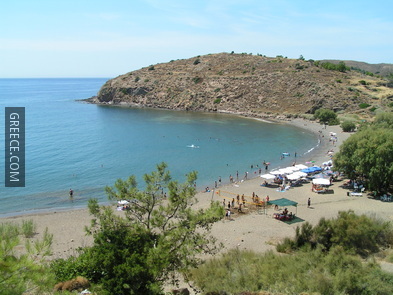 Lefkathia: This beach is located 42km northwest of Chios Town and it is the most well-known and thus crowded beach. It is an organized sandy beach, ideal for sunbathing with deep, crystal-clear waters. The area around the beach has few hotels and restaurants. 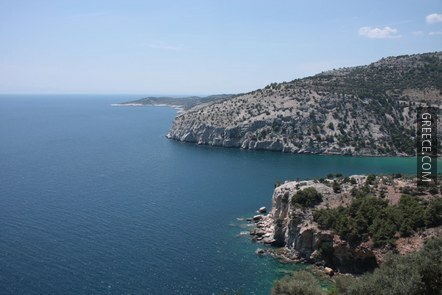 Didima (=the Twins): This beach is located on the road from Limenas Meston to Elata, about 5km from Mesta. 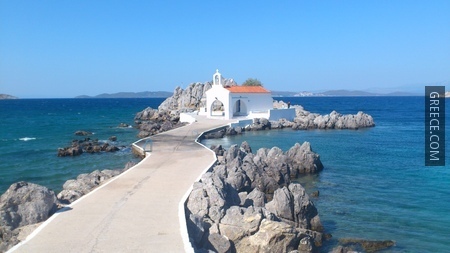 The bay has two similar beaches, with small white pebbles and green-blue crystal waters. 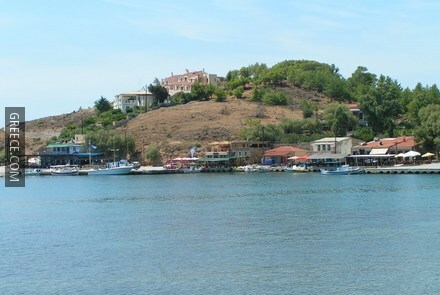 Elinda: It is a well sheltered bay at the west part of the island near Anavatos. It has deep crystal-clear waters, soft sand and it is protected from the winds. Also, there is a wreck of a Roman ship not far from the shore. 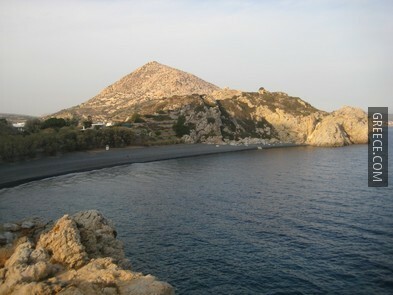 Metohi: This beach is located at the west part of Chios, 2km southwest of Siderounda village. The beach has mainly fine pebbles, while there are also parts with sand and miniscule pebbles. It has crystal-clear waters and a nearby tavern. Magemena: This beach lies at the northwest part of the island, near the village of Volissos. The beach is organized and has sand and deep crystal-clear waters. A beach bar and some accommodations are available in the area. 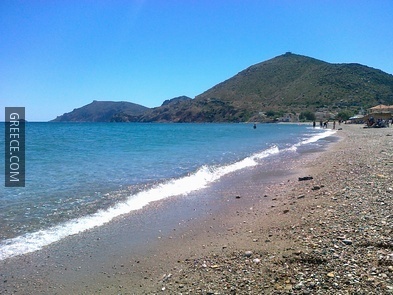 Apothika: This beach is located 40km southwest of Chios Town. It is a very clean beach, completely untouched, well sheltered from Aegean winds and with impressive surroundings of high cliffs and rocks. The beach is unorganized and the 100-meter walk to reach the beach is definitely worth it. 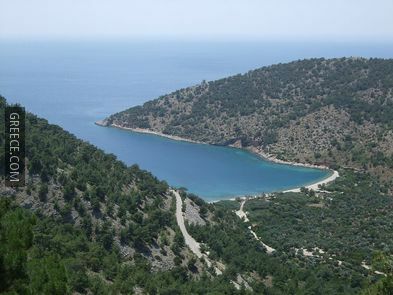 Glari: This beach is located 9km north of Chios Town, near Mersinidi. It is an organized sandy beach, quite cosmopolitan, with amazing waters and a beach bar. 1. 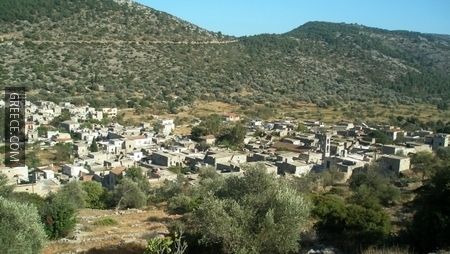 Anavatos: This village is situated 16km from the capital, on top of a mountain in the central part of Chios. Anavatos, meaning inaccessible, reveals why the settlement was built here. Even the road to the settlement was hidden to an inexperienced eye. This abandoned village breaks the rule, compared to the other villages: it has no defense tower and it is speculated that it was built during the latter years of the Turkish occupation. Taking advantage of the natural protection, the inhabitants created a circular wall around the houses, making them seem glued together. The 400 houses inside the walls were narrow, built of gray stone, with flat wooden roofs, low doors, tiny arched windows and wooden terraces. Today, many of its houses still stand, as well as the wonderful three-storey building where the olive press was housed, the School, the church of Taxiarchis and the Virgin Mary. To get to Anavatos there are two ways. 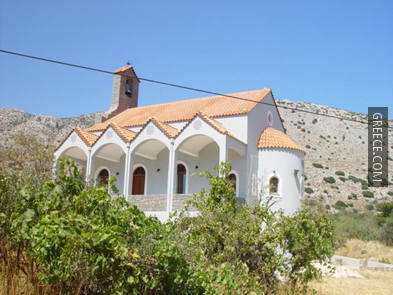 The first one is by a 45-minute walk following a wonderful path, which connects the village to Chios Town. 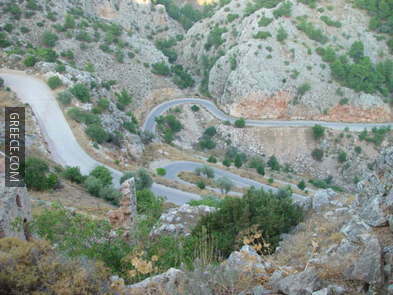 The second is also a climbing path in the forest, starting from Provatas Mountain. 2. Giustiniani Palace: This historical building dates to the 14th or 15th century A.D. and is situated between the central gate of the castle of Chios and the main square of the walled part of the town. It is believed to have been the headquarters of Genoese Podesta. The building, which looks like a fortress, has two single-roomed floors, raised high above ground level. On its northern side, there is a small loggia and a external stone staircase, leading to the walls and the southeastern tower of the castle. Exhibitions of Byzantine murals, post-Byzantine icons, Byzantine and Genoese sculptures and small-scale works of art are housed in the building. 3. 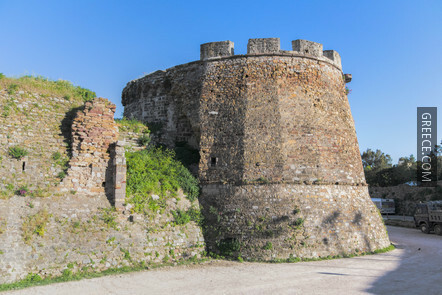 The Castle: The Fortress of Chios lies to the north of the modern city centre. When it was built, it enclosed the whole city, but soon the town expanded outside its walls. 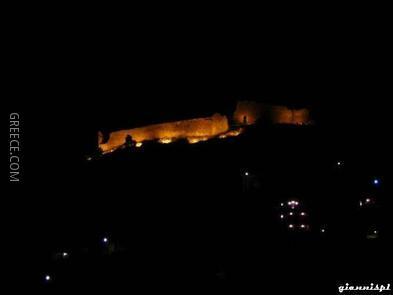 The Castle was the shelter of the Ottomans and Genoese but was originally built by the Byzantines. 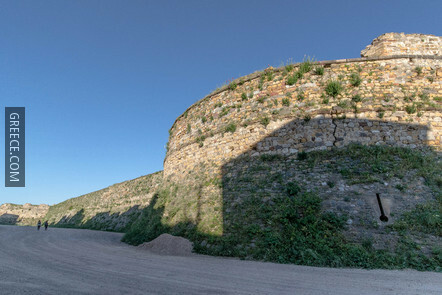 However, almost no part of the original byzantine fortification has survived. The present form of the castle is the result of a series of additions, reinforcements and repairs, made by the Genoese, the Venetians and the Ottomans, in the period from the early 14th century till the Greek Revolution. Nowadays, many destroyed parts of the castle have been restored and visitors may also visit the Giustiniani museum, a Turkish cemetery, etc. 4. 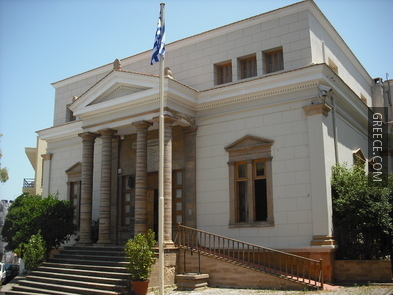 The Archaeological Museum: The museum of Chios was constructed between 1966 and 1971. The building comprises of exhibition rooms, storerooms, workshops and offices, which cover an area of 1200m². The collection has artifacts of almost all historical periods. Collections of prehistoric and archaic finds from excavations in Emporio, Neolithic finds of the British excavations in Agios Galas, archaic and classical finds from the excavations at Fana are housed in the museum. Of importance is the historically interesting Letter of Alexander the Great to the Chians. 5. The Monastery of Nea Moni: The Byzantine style monastery Nea Moni dates back to the 11th century and it is dedicated to the Dormition of the Virgin. 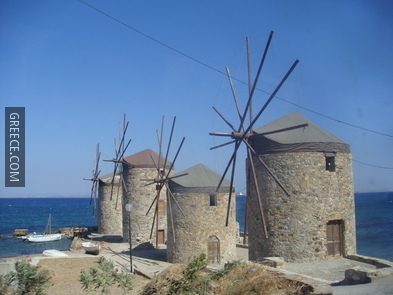 It is the most significant monument of Chios and one of the finest Byzantine buildings. 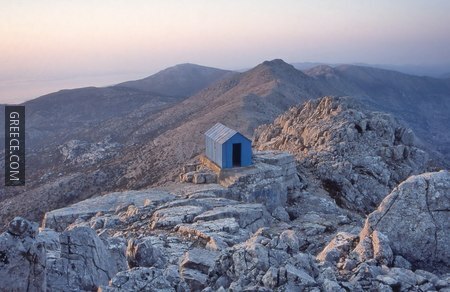 It is located 15km west of Chios Town, in the area of Karies. The monastery was built by the Byzantine emperor Monomahos, as a promise made in front of the holy icon of Theotokos in Lesvos where he was exiled; he said he would build a monastery on the place the icon was found when he would become emperor. Two years after his promise, he became the Byzantine emperor and ordered his best architects and artists to build Nea Moni. The construction took 12 years. The building is similar to monuments that can be found in Constantinople, and its typical octagonal style can only be found in Chios and Cyprus. Air: Chios has virtually daily connections to Athens and Thessaloniki. 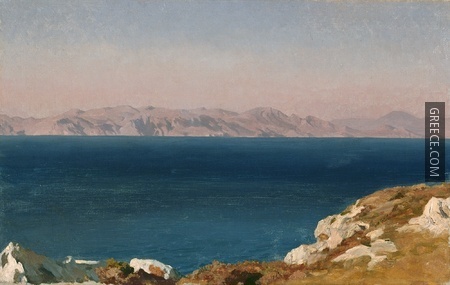 It is also connected to Rhodes, Chios and Lesvos. 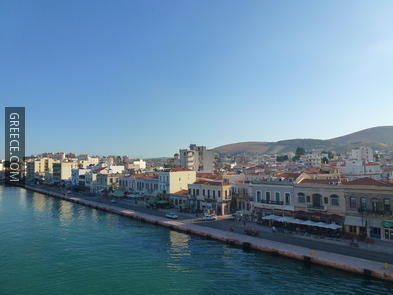 Ferry – Domestic: In summer, several ferries connect the island to Piraeus (8 hours), Lesvos (3 hours), Kavala (16 hours), Thessaloniki (18 hours) via Limnos (11 hours), and Alexandroupolis (16 hours) via Limnos and Samothraki (14 hours). There are also a few weekly boats to Samos (4 hours), Kos (9 hours) and Rhodes (15 hours). Ferry – International: Boats to Turkey run all year round from Chios. During April and October there are usually three ferries weekly to Cesme. During May, there is an additional route, and from July to September, there are daily connections. Hydrofoil: During summer, there are a few hydrofoils per week to Samos (3½ hours) and Lesvos (1½ hours). Bus: In summer, from the long-distance bus station in Chios, there are eight buses daily to Pyrgi, five to Mesta and six to Kardamyla via Langada. There are four weekly buses to Anavatos via Nea Moni and Avgonyma. Also, there are regular buses to the main beaches of Emborios, Komi, Nagos and Lithi. Buses to Karfas beach are operated by the blue bus company. Schedules are posted at both bus stations. 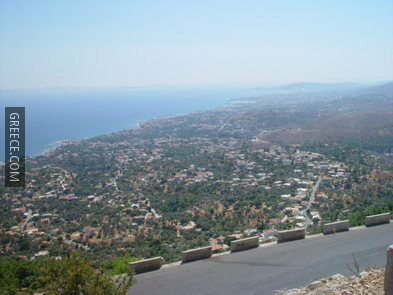 You can also Rent a Car in Chios using Greece.com's Chios Car Rental Engine. Chios has a typical Mediterranean climate, with strong north and northwest winds and mild temperatures which do not exceed 29 degrees Celsius. The winter is short and rainy, and the summer is hot with little precipitation.